Green, green, and more green! No, we’re not talking about jealousy, spring, or the Shamrock Shake that’s back at McDonald’s. We’re discussing one of the most festive holidays in the Cincinnati and Dayton area: St. Patrick’s Day! With so many pub crawls in the area, wouldn’t it be more beneficial to plan your own with your friends as you’re driven around by our transportation services? 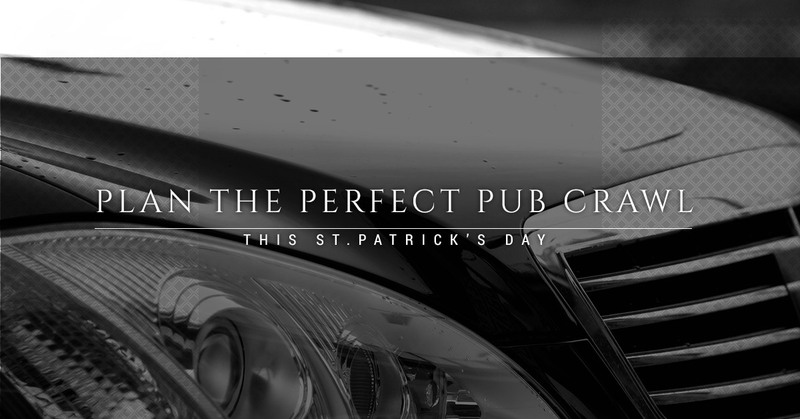 How enjoyable would it be to visit each of these pubs and bars in a car service? You and your friends will arrive at each of your destinations safely, happily, and ready to celebrate in green. To book our transportation services, contact us today. Instead of signing up for a pub crawl — because let’s face it, sometimes there are some places that you probably want to avoid — you can create your own for you and your friends. We supplied a few bars that we strongly recommend that you try this year. While this isn’t Cleveland and the things to do on St. Patrick’s Day are more limited, that doesn’t mean that you and your friends can’t have a fantastic time planning and deciding where you want to celebrate this enjoyable holiday. With St. Patrick’s being on a Saturday, take advantage of a long weekend and indulge in some green as you enjoy beer, whiskey, corn beef, and cabbage. Flanagan’s Pub: Located on East. Stewart Street in Dayton, Flanagan’s Pub is a great place to start. First, it’s affordable. Second, you’ll arrive in style with our transportation services. They also offer some delicious food that will leave you feeling pleasantly full as you continue through your crawl. The Fieldhouse Of Dayton: Are you ready to enjoy a bar that has fishbowls, delicious drafts, and enough room for your entire group? Established in 1996, the Fieldhouse is a perfect place for you to enjoy St. Patrick’s Day. As a sports bar and pub, you’ll be able to enjoy an array of beers and cocktails. The Century Bar: Check out the best whiskey bar in the Dayton area. Located on South Jefferson Street, this bar has over 100 types of bourbon and whiskey. Yes, you read that right. Over a 100 different types! If you want a whiskey or bourbon that’s more common or one that’s more obscure, they have you covered. Romer’s Bar & Grill: If you want something a little more pricey, then Romer’s Bar & Grill is the right place to come to. You can expect to find food and drinks at this location and they open early and close late. Lucky’s Taproom And Eatery: Lastly, if you want to relax, regroup, and enjoy an ice cold beer, then Lucky’s Taproom And Eatery is the right place to come to. Rated as one of the Best After-Work Drink Spots, this laid-bar bar is a great place to enjoy some comfort. Remember that St. Patrick’s Day is a holiday that you should hire someone to take care of the driving. Instead of risking a DUI or an accident, hire our transportation services to get you to your bars and pubs safely as well as to your home in one piece. After all, don’t you want to have a fun-filled night without worrying about parking, police, and possible mishaps?